with self-managed or hosted DataDuck ETL. Built with Amazon Redshift in mind, DataDuck ETL can extract from multiple data sources, then transform and load the data into your data warehouse. Let us know if you'd like to use something other than Amazon Redshift. DataDuck ETL is simple to set up and manage. A lot of companies want a data warehouse without having to set up something like a complicated Cascading and Hadoop system. DataDuck ETL can be set up in under a minute with the "dataduck quickstart" command. DataDuck ETL's open, flexible platform solves a real challenge for your business: consolidating your data into a single data warehouse. 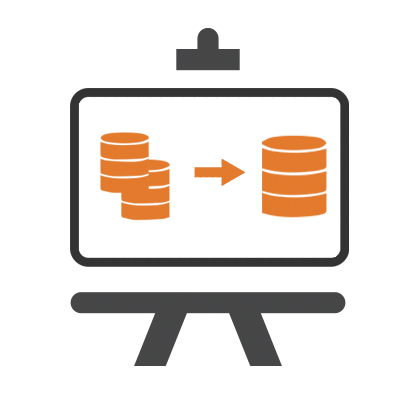 Our ETL platform will extract, transform and load data into your data warehouse on Amazon Redshift. With DataDuck ETL, you can have your data warehouse up and running quickly, allowing better insights and analysis over your data. DataDuck ETL can be self-managed on EC2, allowing for greater control, security, and privacy for your data. If you would rather have us manage it for you, DataDuck ETL is also available as a hosted solution. Get in touch and let's discuss further.